It was to an isle of apple trees that Arthur, legendary king of the Britons, was taken after receiving a grievous wound, according to Malory in his epic, Morte d’Arthur. In those days the apple was looked upon as the noblest of trees, and the mysterious and magical Avalon was known as the isle of apples. Sadly today Arthur would be hard-pressed to find an orchard in which to go and die peacefully for in the last quarter of a century half of Britain’s apple orchards have disappeared. And it’s the same story for pear orchards. We find the first account of an orchard in Homer’s Odyssey, written nearly 3,000 years ago, but in Britain, while druids may have planted apple trees as hosts for their beloved mistletoe, it’s likely that the first real orchards were planted by Roman settlers. In the latter half of the first millennium there was an increasing number of monasteries being built and within their grounds there would usually be a vegetable garden and an orchard. The French invasion of 1066 brought an influx of Norman apple-growing and cider-making experts as well as many new varieties of apples. Then it wasn’t until the sixteenth and seventeenth centuries that the next major expansion of orchard cultivation took place. Indeed, such was the enthusiasm then for self-sufficiency that it was suggested that a law be passed to force every land-owner to grow their own fruit. A canker epidemic, a country at war, taxes on imported fruit and other conditions all played a part in the ups and downs of the apple-growing business over the next few hundred years. The twentieth century saw an increased demand for land, especially on the edges of towns, for house-building, as well as an increase in the availability of cheap imported apples making apple-growing unprofitable. If we look at the number of orchards in existence now and compare it with number at the height of the apple’s popularity in the nineteenth century we discover a shocking statistic: the number has decreased by two-thirds. 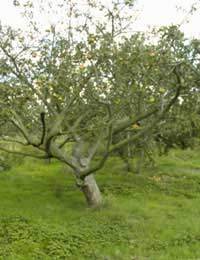 Traditional orchards - as opposed to intensively-managed fruit-producing farms - are recognised as being a haven for wildlife with their gnarled mossy and lichen-covered trees providing a marvellous habitat and food source. Research has shown that a traditional orchard will attract twice as many species of birds as its high-density counterpart. A traditional orchard will consist of fruit trees – and maybe an occasional hazel or walnut tree - grown on an area of grassland, usually surrounded by hedgerows, combining the best of many possible worlds as far as wildlife is concerned. Is there a future for the traditional orchards of Britain? Several factors suggest that there is. Firstly, in our more environment-conscious society there has been a revival of interest in home-grown apples. Although a high number of apples are still imported, especially for the production of apple juice, these days most large supermarkets and quality greengrocers will have a selection of local apples, many with uniquely British names. The charity, Common Ground, has, since the late 1980s, been working with local communities to conserve old orchards and to encourage the setting up of community orchards, often in towns, to provide fruit and possibly more importantly a peaceful refuge for both wildlife and humans. And at Cotehele, in Cornwall, the National Trust now runs a ‘mother orchard’ in which are cultivated 120 varieties of apples all of which have been grown in the west Country in the past. Some were thought to be lost while only one or two examples of others existed. The plan is to make sure we don’t lose some species altogether and, once successfully cultivated, to reintroduce them into other orchards. As well as Cotehele, a number of National Trust properties have orchards including Acorn Bank Garden and Watermill, near Penrith in Cumbria, which is especially recommended for the tea-room that uses fruit from the orchards in its puddings, and Felbrigg Hall in Norwich that has a walled garden providing fruit and vegetables for the restaurant. For an example of a community orchard visit Butterfield Green, Hackney, London. Planted in 2007 D’Arcy spice and Merton russet apple trees sit happily alongside pear, plum and hazel trees in an area created by the local community association. At the other end of the scale Brogdale Farm in Faversham, Kent, houses the National Fruit Collection on 160 acres of orchard. Guided tours are available or you can take your own self-guided walk through the well-signposted orchard. An orchard has been established on, a community allotment site. Of about 40 mixed fruit trees. The council took over the site last year, accepted the community Orchard witch was provided by lottery funding. The orchard is about 5 years old. the council has decided to dig up 6 trees and replant them elsewhere. Can the council do this, by law..
Just want to know which fruit is national fruit of UK. I did not see anything on the net. However,as far as I know it is Apple. Anyone help me in this regard.